The reception is one of the most fun parts of the entire weekend. Couples look forward to this event the most. They get to finally let loose and party with friends and family. You have to set the right tone for the night. If you are excited and energized then people will feed off that energy and do the same. But before the party begins, there are a few more intimate moments to go through; one being the first dance. 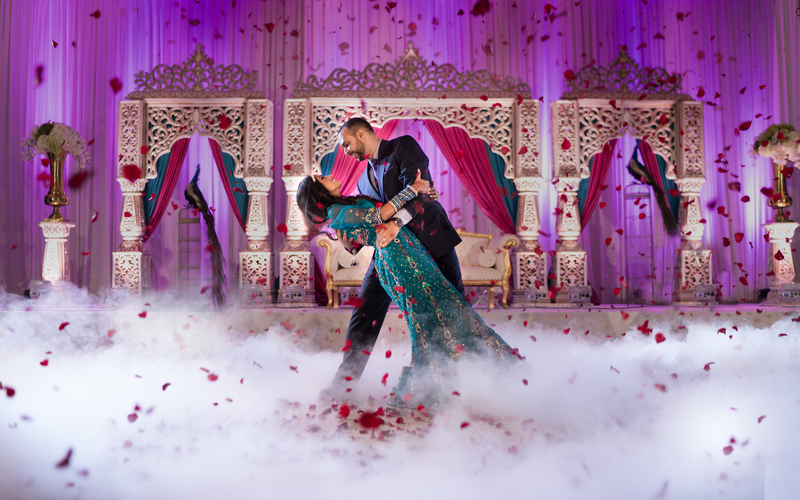 Most of the time couples are choosing American songs for their first dance, but we wanted to give you a mix of Indian and American songs that are great for a first dance. We have seen many weddings where the couple either uses these songs or considers using these songs. We kept an intimate first dance in mind, when choosing these songs to be a part of this blog. The following Top 10 Indian Wedding Reception First Dance Songs are ranked based on what we have seen used most often within the last few years. The Top 10 Indian Wedding Reception First Dance Songs list begins with the perfect song to be number one; Perfect by Ed Sheeran. When you listen to these lyrics you'll start to tear up just a little and you'll feel a warm fuzzy feeling that will make you want to use this song for your first dance. Fill out the form on this page and we will send you an email with all these songs on a playlist. If you need a song for the bride and groom's main reception entrance, check out this blog. Ed Sheeran is the master of the modern day love songs. He secured the second spot on this blog series as well. Couples really love his voice and the music he produces. It speaks love from every angle. Take each other in your loving arms and feel the awww's in the crowd fill the room. Fill out the form on this page and we will send you an email with all these songs on a playlist. If you need a song for a bridesmaids reception entrance, make sure and check out this blog! The first Bollywood song to be featured on the Top 10 Indian Wedding Reception First Dance Songs list goes to the most epic love song; Tum Hi Ho! It kind of reminds of the Indian version of John Legend's All of Me which you'll see next. This is played at almost every Indian wedding in the last two years either used as a first dance or even played during dinner time. If you need a DJ for your wedding that knows music and will take care of you, contact us here. This song has love written all over it. 100% commitment to each other and you expect this love to be what you hold for the rest of your lives. What better way to describe such a beautiful love than with this wonderful song by John Legend. Likewise it reminds us of Tum Hi Ho as both songs seem to go hand in hand in terms of the rhythm and overall feel. Fill out the form on this page and we will send you an email with all these songs on a playlist. If you need song for a groomsmen's reception entrance, feel free to check out this blog. The fifth spot on the Top 10 Indian Wedding Reception First Dance Songs list goes to Christina Perri's A Thousand Years. For all the Twilight fans, this song was huge when it came out. When your guests hear the piano beginning, they'll know exactly what song this is and it usually brings tears of joy when they'll see you have your first dance as a newly wedded couple. Fill out the form on this page and we will send you an email with all these songs on a playlist. If you need an epic reception entrance for your bridal party, check out this blog. This song is featured in the biographical movie M.S. Dhoni. We have noticed that since this song came out in 2016, it's been used most often by our Gujarati brides. The song is in Hindi, but something about it has our Gujarati brides loving it. Often our brides look for songs that haven't been played before (at least not often), maybe that's how it got popular. If you need a song for your siblings with kids entrance song for the reception, check out this blog. Here's Arijit Singh's second song on The Top 10 Indian Wedding Reception First Dance Songs list. His voice is magical and usually is a top contender for intimate moments at the reception such as a first dance, cake cutting, or even played during dinner time. How can you not love his voice? Right! Fill out the form on this page and we will send you an email with all these songs on a playlist. If you need a reception entrance song for your single brother, make sure go through this blog. Arijit Singh has made the list now for a third time and still isn't done. Like we said before his voice has magic in it and is complimented with great music that is meant for a first dance. In recent years, since his release of Tum Hi Ho, Arijit has been singing more and more love songs for Bollywood movies. Fill out the form on this page and we will send you an email with all these songs on a playlist. If you need a song for your single sister's reception entrance, check out this blog. The Top 10 Indian Wedding Reception First Dance Songs list would not be complete without an Atif Aslam song. Here's another wonderful Bollywood love song singer. We know Atif has come out with more songs in 2018 but we have seen couples use his best love song from 2017; Dil Diyan Gallan. If you love Atif, here's the song for you. If you still need a song for your parent's reception entrance., check out this blog. With almost half the features on this blog, here's Arijit Singh's fourth and final appearance on the Top 10 Indian Wedding Reception First Dance Songs list. Compared to the other three of his hits this one is used least and can be a good song for your first dance if you want to have something different. Fill out the form on this page and we will send you an email with all these songs on a playlist. If you need a song for your mother son dance, check out this blog. A wedding is the happiest moment in your life and you should choose music that you love. Over our 25 years of bringing joy to thousands of couples, the DJ Riz Entertainment team has helped many couples find the songs that help them create memories for a lifetime. Top 10 Indian Wedding Reception First Dance Songs list was made to help busy couples that don't have time to find the best music for their big wedding weekend. If you or a friend needs an Indian wedding DJ that will take the time to understand what you need and help make your wedding weekend perfect, contact us here for more information on our services.